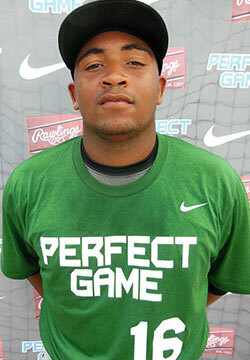 Brandon Dorsey is a 2017 3B/1B with a 6-1 210 lb. frame from Mount Airy, MD who attends Calvert Hall College HS. Strong and thick build. Right handed hitter, wide base with a leg lift trigger, gets to his front side well, busy hand load, line drive swing plane with good bat speed and lots of strength at contact, has some lift out front, pretty easy low effort swing, may have to work on timing with his hands pre-swing. Corner infield tools, has the arm strength and carry to play third base, gets on top of his throws well, stays balanced well with short steps and has a good exchange and release. Will play as long as he hits. Verbal commitment to North Carolina.